Amazon Price: N/A $164.99 (as of – Details). Product prices and availability are accurate as of the date/time indicated and are subject to change. Any price and availability information displayed on the Amazon site at the time of purchase will apply to the purchase of this product. Hike in and hit the water with the Blue Wave Sports Nomad 1 Person Inflatable Kayak. This durable PVC kayak is perfect for riders up to 230 lbs. in calm or rough waters. A removable fabric seat and foot rest keeps you comfortable as you paddle with the lightweight but durable aluminum oar. The Nomad inflates easily with the included foot pump and deflates just as easily with the oversized high pressure valve. When your done the kayak packs up into the included rip resistant carry and storage bag. 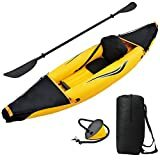 This is the perfect kayak for paddlers of all experience levels looking for a boat that doesn’t require a luggage rack. Additional Specifications Built in safety valve. Large Grab Handles and rings for carrying and connecting to other floats Two directional bottom fins for added stability and control Foot pump included Easy to use repair kit One piece 87-in. aluminum oar From its humble beginnings ten years ago as a small-time pool chemical company, the Illinois-based Blue Wave has grown into a leading manufacturer and distributor in the pool and home leisure industry. Their products range from full above-ground pool kids and accessories to in-home table games and saunas, all of which are made with the same goal in mind: provide consumers with what they want at a level of quality that not only meets, but exceeds expectations. In addition to being a trusted brand that both manufactures and distributes, Blue Wave prides itself on providing the best customer service staffed by knowledgeable employees ready to guide you toward making the perfect purchase to suit your needs. Dimensions: 118L x 30.5W x 13.5H in.. Durable 24 gauge PVC body with anti-leak high frequency welding. Adjustable and removable fabric seat and footrest. Easily inflates and deflates with an oversized pressure valve. Inflatable floor, hull, and I-beam. Packs up for easy storage and carrying in rip-stop case.